Steamboy (Revere MA US) on 2017-11-07 20:33:08. In part 4 made in 1997, there are lots of songs that James Coffey wrote and performed, like stop look and listen, smooth operator with N&W 611 & SP 4449, what do you hear with Strasburg railroad, Illinois railway museum, and Lionel trains, signal lights, I'm an engineer, early in the morning, and the popular dinosaur song. Plus the opening theme song shows on a Marx layout. 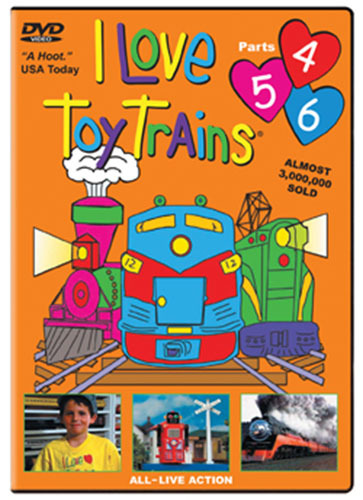 In part 5 made in 1998, There are 3 out of 4 Zany Buster segments with Joe Stachler speaking through the dispatcher's radio clearly, Plus Jeff makes his narration debut as a 6 year old as he learns about the wheels of the Steam locomotives, Jim Coffey's Old MacDonald Had a train, The Commodore Vanderbilt taking a washdown, as well as some standard gauge steamers. Jim Coffey's This Train, Learning about doubleheaders with NKP 587 & N&W 611 in the 1989 independence limited, learn about how lumber was made at a lumber yard, Jim Coffey's Down by the station with The Grand Canyon Railway 18, Pennsy 1361, Mississippian 76, CP 2317,and Pere Marquette 1225. Montage of barrels being loaded a look at MTH reissuing one of the standard gauge steamers with Updated Effects, and Jeff has a tip on why books are always fun. In part 6 made in mid to late 1998, Jeff talks about the Pennsylvania railroad's GG1, James Coffey's wooden train song, a visit to the hesston steam museum, James Coffey's popular animal train song, how maintenance of way vehicles work with James Coffey's laying down those railroad ties. How cranes work with clips from "Lionel Accessories" part 1 made around the same time and James Coffey's hard workin' crane song, and also different bridges, also using clips from Lionel accessories part 1, with James Coffey's build a bridge song. Would I recommend this to Kids of all ages? YES. And its also to learn and enjoy these more often rather than watching a Quarter of a billion view videos of Sesame Street's Elmo's World on Youtube.